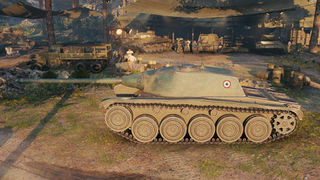 Der AMX Chasseur de chars ist ein französicher premium mittlerer Panzer der Stufe 8. 1946 präsentierte die Firma AMX diesen Entwurf für ein neues Fahrzeug. Der starke Motor und das geringe Gewicht hätten das Fahrzeug sehr mobil gemacht, die 90-mm-Kanone mit Selbstlademechanismus stand für eine hohe Feuerrate. Die riesigen Abmessungen des Fahrzeugs, seine dünne Panzerung, hohe Kosten und die Komplexität des Entwurfs machten das Fahrzeug unbrauchbar. Es wurde daher kein Prototyp gebaut. The closest match gameplay-wise for AMX CDC are Japanese medium tanks. Players experienced with Japanese mediums will feel right at home. The key features describing the CDC are the outstanding (almost light tank level) mobility, efficient armament, and last but not least paper-thin armor. And the armor is almost literally paper-thin in this case, not mentioning the unusually large size of the vehicle hull, which is bigger than most heavy tanks of its tier. 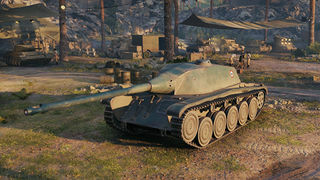 Most tanks in tiers 9 and 10 will overmatch your 30 mm thick armor plates with ease, which means full damage from incoming High Explosive shells too. 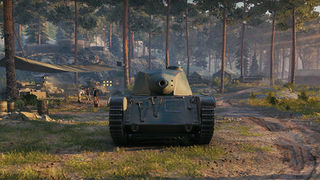 No wonder the tank needs an extraordinarily cautious and careful play style in order not to get killed in the very first minutes of the battle. A smart combination of using cover (guerilla peek-a-boo), its outstanding nimbleness and its great gun depression are vital to mastering this fragile but dangerous tank. The CDC, while having good speed, has no armor, which means you MUST use hard cover when shooting. Abusing your 10 degrees of gun depression for cresting in hilly terrain is a good way to provide this cover. Its speed fortunately allows the CDC to get to good sniping spots early on, evolving to flanking in the later stages of the game. Avoid staying out in the open for extended periods of time though - if you're spotted out of cover, you will usually die quickly. The CDC is a good credit farmer, a decent game can make up to 25k - 40k profit. Designed as a tank destroyer, not a medium tank.